I'm not sure when I heard about yarn bombing or knit grafitti. Maybe a year ago?? I don't know. But I think it is rather groovy! Though many knitter's reasons for doing knit grafitti might be slightly varied, the basic concept is the same: to bring a bit of happy to a community & a smile to people's faces. 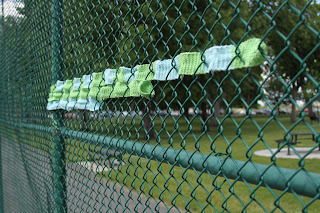 Once I learned to knit last December, I knew I wanted to be a part of this textile street art movement. For the last few months I've been meeting with my knitting/crochet crew, The Knit Witz & I've brought up the idea of doing some knit grafitti. My friend Susan even purchased a book that I have "borrowed" for quite some time now called Yarn Bombing: The Art of Crochet & Knit Grafitti by Mandy Moore & Leanne Prain. But my suggestion & idea got no takers. A few weeks ago I knew I'd be in Washington & I thought that would be the perfect time to attack something with yarn. 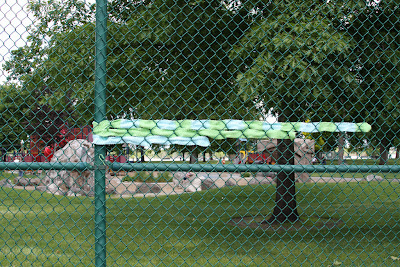 I decided to copy a project seen in the yarn bombing book: strips of yarn were connected & woven into a chain link fence. 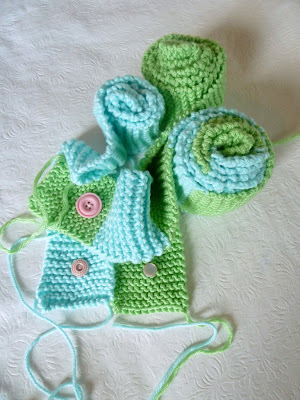 I had been playing with two colors of yarn---teaching myself to transition from one color to the next. So, I thought the motivation of needing to do long strips would give me great practice to work on one continuous color-changing piece. 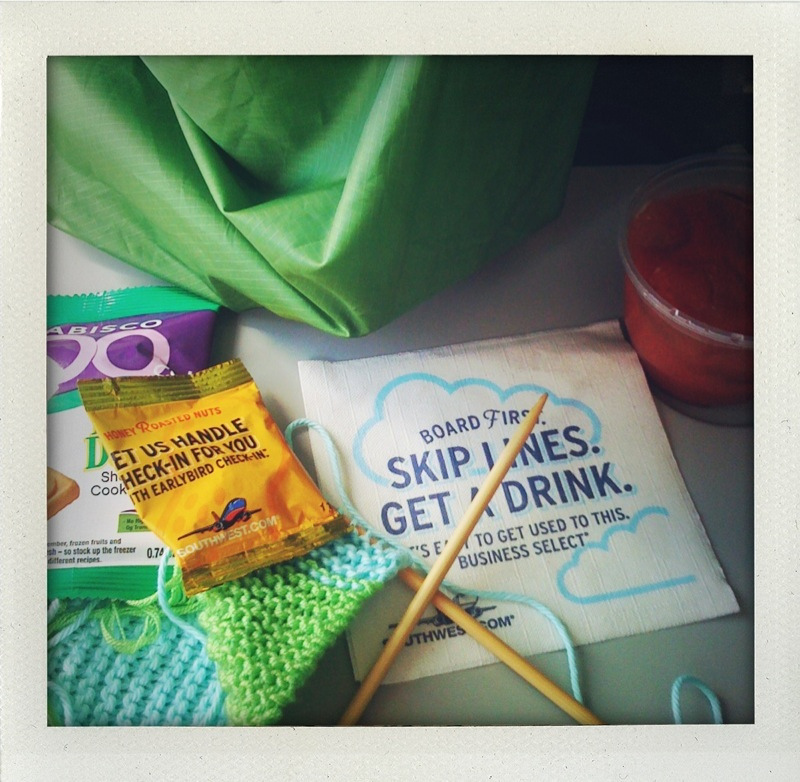 I knitted & knitted & knitted for a week & a half while on vacation with the fam in Omaha & while taking plane rides & on layovers to Washington. I noticed in the book that a lot of knitters that grafitti, used some sort of bulky laminated tag as their "calling card"--attached to their final piece. Maybe I'll change my mind later, but it seems to take away from the piece to have this chunky tag flapping around. In the future I would like some small way of letting people know that "WhiMSy love" was here. But for now, I purchased vintage pink buttons & will use that as my calling card, my stamp, my label, my signature, etc. I sewed one onto each yarn strip. Tia & I decided to go to a park in the late evening. Around 9:45 p.m. she picked me up from my parent's house. My brother was convinced I'd get arrested. But, I already had my speech prepared: "Officer, we aren't doing damage to any public property. 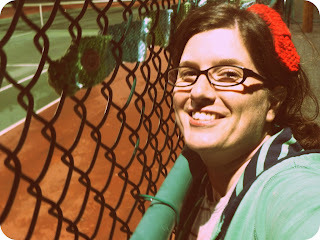 Lookie here, I can just snip, snip, this pretty fuzzy yarn off the chain link fence & no harm done. Will you please take the handcuffs off my friend Tia? She was only video taping. She has nothing to do with this. Yes, she drove the getaway vehicle, but really, a minivan as a getaway vehicle?? Pshaw! Who are we kidding? 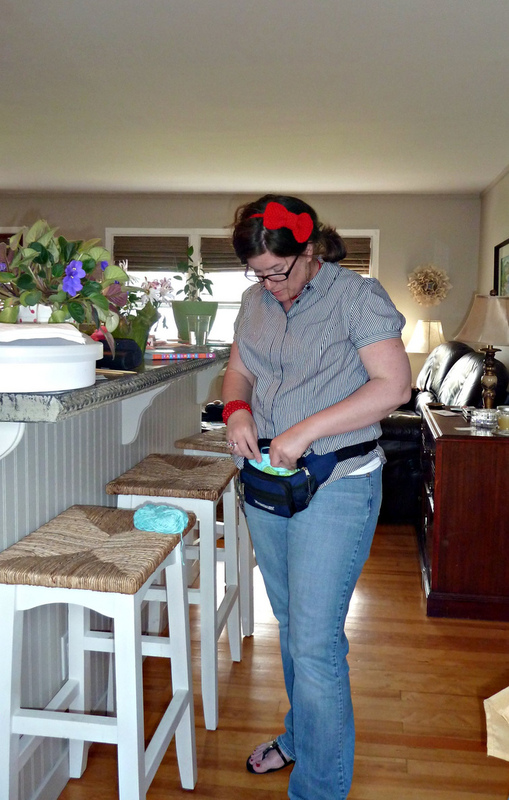 Now, come to think of it, you SHOULD arrest her: for not wearing an awesome fanny pack like me." My grandmother was so cute when I was leaving to go grafitti. She said, "Good luck!" 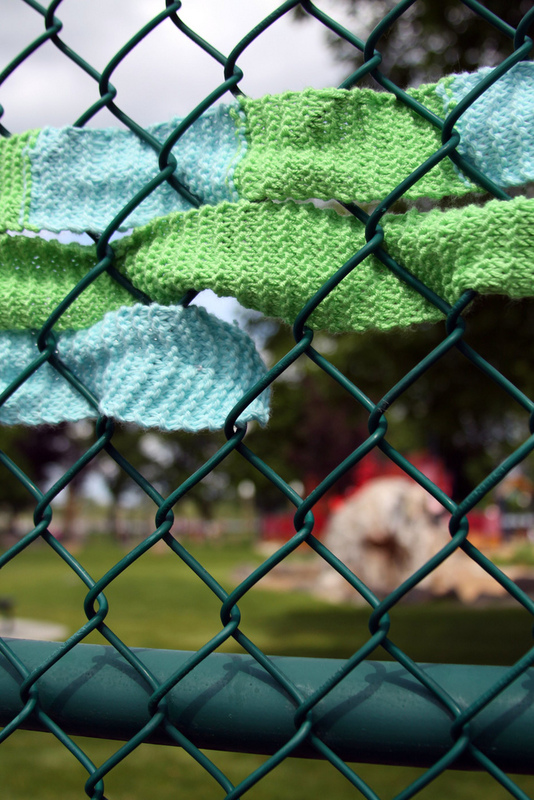 I had been eyeing a fence near Howard Amon Park to craft up with yarn. I wanted to grafitti someplace that was special to me. And I've always loved that park & the river. But not the goose poop or the teenagers who jump around the playground equipment meant for those prolly 12 & under. I remember often going through Zip's drive-thru as a teenager & grabbing a bacon double cheeseburger---no onions, no pickles, with a butterscotch milkshake & Tater Tots & than I'd go sit by the river & eat it. Or, when Pazely was still in my tummy & I was VERY near the end of my pregnancy, I remember walking along the river with my mom. My mother was trying so hard to walk Pazely right out of me. So, that park holds lots of memories. Tia & I pulled into the parking lot, in between 2 cars with people inside. It was dark in the park---EXCEPT for the giant floodlights shining on the exact tennis court fence I was going to grafitti. DARN. Well, if we were going to do this, we might as well wander through the dark park now. Just the two of us. Yep. This is normal. Two grown ladies, just strolling through a pitch black park. At 10 o'clock at night. With a SKUNK!!!???! We squealed. But the skunk wiggled off in the opposite direction of us. Though the stinky bum skunk was out of sight, we were still paranoid about him the whole time. I was giggly with nerves. I didn't know what I was doing. I was kind of panicked. 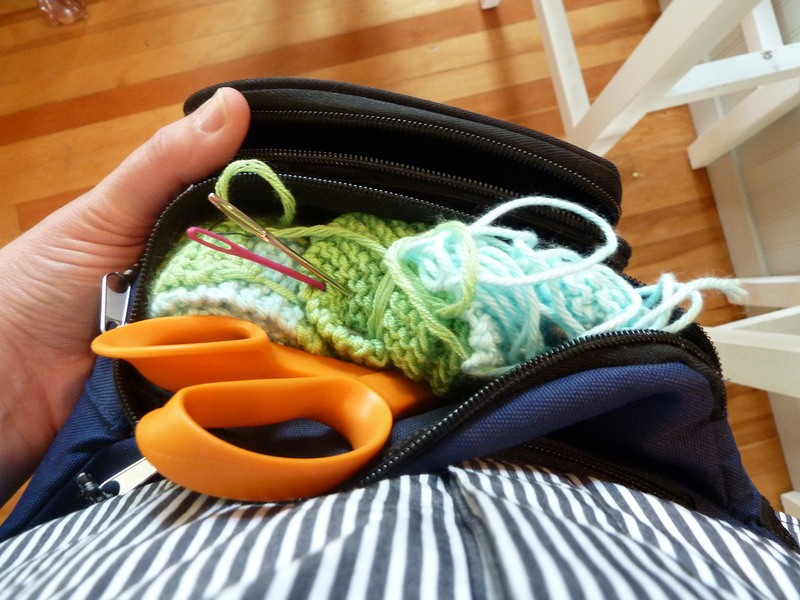 I was fumbling over the yarn & the needle & things kept falling out of my hands. The results were a bit messy in the end. I was trying to go quick---too quick---& it was my first go at it. Looking back, I see that I could have totally slowed down & not been so scared. No one would have cared & we weren't doing anything wrong. Just something different. The next day my mom & sis & sis-in-law & nephew & nieces met at that same park to play. 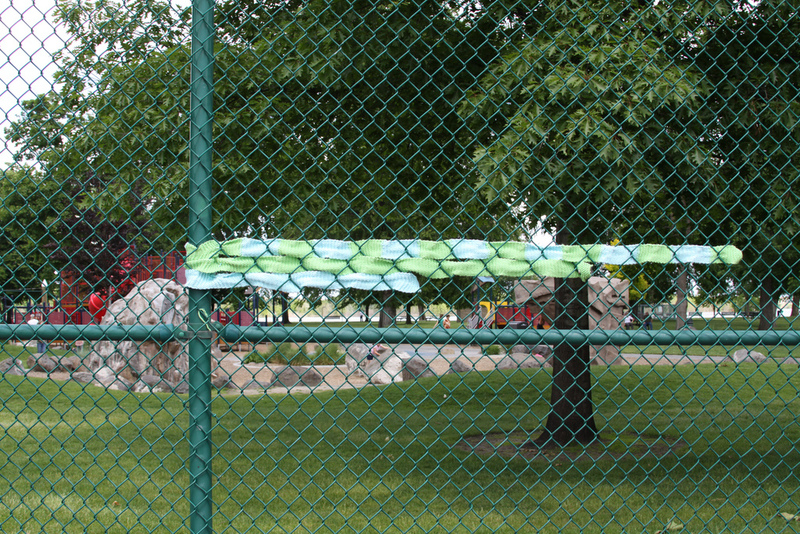 The playground is right across from the chain link fence where I attached my yarn art. It was fun to see the grafitti still there & take some pictures in the daytime. 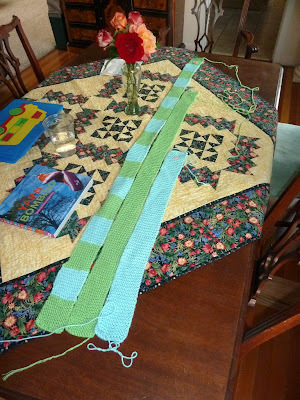 I wish I would have had time to knit a couple more strips. It looks kind of wimpy. So skinny & needy. Oh well. It's my first. My dad (who totally loved the idea of knit grafitti), works for the Veterans Affairs Medical Center. He was telling people in his building that his daughter was doing some "bombing". Um, dad, NOT the best lingo to use. Click HERE for the rest of the photos of that night. And a short dumb video of Tia & I trying to figure out how the video camera works & introducing our knitting grafitti. We are dorks. We needed cue cards & I needed to wear a more slimming sweatshirt. Tia still has the loooooong video we took of the whole process. But I'm sure it's just a bunch of "Oh my gosh!! Is that the skunk again???" And "Is someone coming?! EEEEK!!!" And why didn't you call me? Yarn...knitting. I'm there, dude. Love it! I took the same book out of the library a few months ago and I've been dying to do a bombing but I I've been trying to convince someone to do it with me. You have inspired me - I will go solo if that's the way it has to be done. Love your stripe...you're awesome! This knit graffiti is a really unique idea. Sounds like you had quite an interesting time placing it in the park. This reminds me of a daycare I pass on my way to work. Every winter, someone puts a "sweater" on one of the trees out front and every spring, it's gone. It's basically a patchwork of knitted yarn wrapped around and sewn onto the trunk and the main branches.